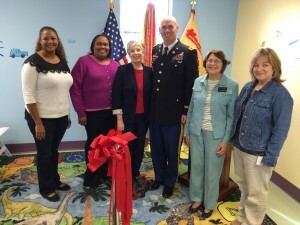 The Redstone Arsenal’s Childwise Program recently hosted an open house and ribbon cutting ceremony at its new location. Childwise Play Mornings, under Army Community Service, are offered twice a week to the Redstone Community and are led by employees of the National Children’s Advocacy Center. The program is open to any parents or grandparents with children up to five years of age who have access to the installation. Play mornings offer the child the chance to interact with other children of their own age, play with age appropriate toys, do a craft and eat a snack with his or her parent/guardian.